What's the difference in a GDR, a Cumulative Update, CTP, RC, and a Service Pack? Microsoft changed the terminology for SQL Server pre-releases. They are now referred to as CTPs (Community Technology Previews). As the product enters it's final stages before release, the feature set is complete and the product is undergoing final testing, it's called an RC (Release Candidate). After a product has undergone significant testing and it's determined that no more changes will be made to the product before release, it's sometimes said that the product has gone golden. It's also called a GA (General Availability) release. Once the bits been turned over to a company to mass produce the media (CDs, DVDs, etc), it's RTM'd (Released To Manufacturing). Over time, Hot Fixes are created by the dev team to address specific product issues affecting certain customers. Sometimes the issue is so wide spread, a GDR (General Distribution Release) is issued so that all customers will receive the updates. CU (Cumulative Update) is created that contains all of the applicable hot fixes. Once a large enough collection of changes have been gathered, an SP (Service Pack) will be issued. 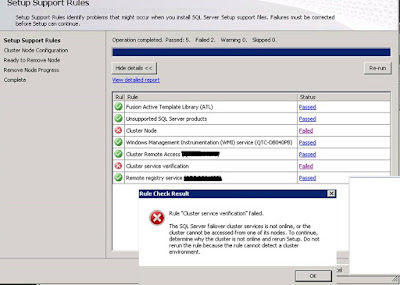 Going ahead we need to apply only CU to SQL Server to bring the system into servicing support cycle. The SQL code was failing for one DB User with DBO permissions on the databases it was accessing. Problem: There was one stored procedure under database DB1 at some point it used to call other stored procedures from DB2. This caused failure when tried to analyse the issue using DEBUG method. SOLUTION: Its fixed for us by doing following changes at code and DB level. 11) Grant user granted public role on master to read objects. 22) Granting View Server State at instance level. There is a change from Microsoft in the servicing model, going ahead from SQL 2017 there will No Service Packs. Any vulnerabilities hotfixes will be roll out on need basis and issues will be addressed only through CU and GDR. Below is the script we can use to move the data and log files for the databases except master. We need to import spt_values from other server using import and export method. We need to perform the below steps to delete the jobs or maintenance plans in such cases from sysmaintplan_log table or fromsysmaintplan_subplans table . Check and delete the jobs from SSMS if it exists. Cannot detach a suspect or recovery pending database. It must be repaired or dropped. Note: Below method of removing database is only when database shows RECOVERY_PENDING because of MDF/LDF files missing. Prefer: Use latest backups available to restore the database. C:\Program Files (x86)\Microsoft SQL Server\110\Tools\Binn>RSKeyMgmt /? Performs key management operations on a local report server. -f  file              Full path and file name to read/write key. -p  password          Password used to encrypt or decrypt key. 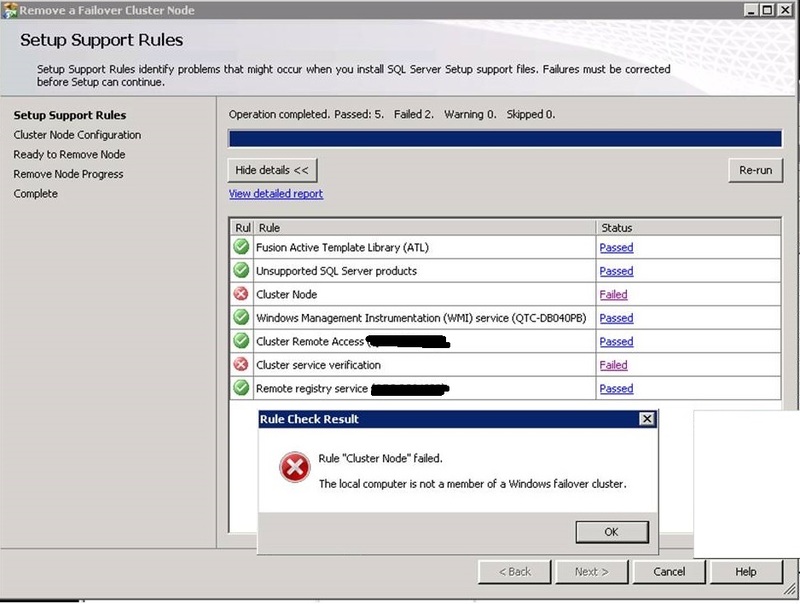 We recently faced this issue, as the server was migrated to virtual and accidentally windows cluster was removed as part of decommission. Box is left out with SQL Server Installation while uninstalling we hit the below error, once the node name was removed it went successful. 1. Remove the entry from regedit. 2. Re-run the uninstall from control panel. The EXECUTE permission was denied on the object 'xp_regread', database 'mssqlsystemresource', schema 'sys'. Receiving 'xp_regread' error as soon as connected to SQL Server Management Studio. @ MONARCH. Simple theme. Powered by Blogger.